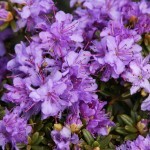 A low dwarf shrub with tiny dark grey-green leaves The foliage is mildly aromatic, especially on warm days. 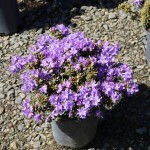 It has early to mid-season, bright purple flowers. H-2. It prefers partial shade to full sun, and moist, cool, acidic well-drained organic soil. Removal of spent blossoms encourages new growth and future flowers.